Thinking of buying or selling a home? If so you'll want to enlist the services of a REALTOR® to help you navigate through this complicated business transaction from start to finish. Your REALTOR® has what it takes to help you every step of the way to achieving your home ownership dreams. And, he or she will be the top player on a team of experts who will protect your interests and ensure your real estate transaction goes smoothly. The team Depending on your needs, the other experts on your team will likely include a lender, a lawyer, and insurance agent and a home inspector. Your REALTOR® will offer guidance as to how to proceed with your purchase or sale and when it's time to bring in the other experts and professionals on your team. REALTORS® role A REALTOR® has vast amounts of real estate knowledge and the experience required to stay cool, even in a hot real estate market. In Ontario, a REALTOR® is a licensed real estate professional who is a member of a local real estate board as well as the Canadian Real Estate Association (CREA) and the Ontario Real Estate Association (OREA). When you work with a REALTOR®, you can expect strict adherence to provincial law as well as to a code of ethics ensuring you'll receive the highest level of service, honesty and integrity. If you are buying a home, your REALTOR® can help you determine how much house you can afford, offer advice on choosing the right neighbourhood and ensure your interests are best served during negotiations. If you are selling a home, your REALTOR® will help you determine a fair and accurate asking price for your home, develop a marketing plan, offer advice to help make your home more "saleable," screen potential buyers, show your home and, of course, negotiate on your behalf. As you and your REALTOR® begin looking for a home, it is wise to also begin looking for a mortgage lender. Your REALTOR® can help you review various mortgage options to ensure you get the best rates and terms available. Although most buyers will start their search with their own bank or financial institution, it pays to shop around for more competitive rates. Often, your bank will match or beat a competitor's rate to keep you as a customer. It is recommended that you have a lawyer waiting in the wings, preferably one who specializes in real estate transactions, to review complicated documents such as the Agreement of Purchase and Sale. 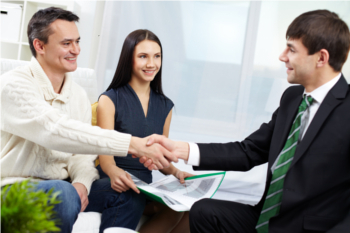 If you are selling, it's wise to have a lawyer review an offer to purchase before you sign it. As a buyer, your lawyer will also ensure you receive clear title to the property and calculate the amount of land transfer tax you will be required to pay. Having a home professionally inspected before you seal the deal to buy can help you avoid costly surprises after you move in. A home inspector will report any minor problems as well as major ones such as structural deficiencies that could affect your decision to buy at all or at what price. In order to secure financing, mortgage lenders require insurance on the home. Just like when you shopped for your mortgage, do your homework with insurance companies too. Insurance coverage and rates vary and you will want to be sure you get the coverage you want at a fair price. Having the right team of experts on your side can mean the difference between a successful real estate transaction and a personal and financial nightmare. When you select your team, start with a REALTOR® - he or she will be your Most Valuable Player. REALTOR® is a registered trademark of REALTOR® Canada Inc., a company owned equally by The Canadian Real Estate Association and the National Association of REALTORS® and refers to registered real estate practitioners who are members of The Canadian Real Estate Association. Used under license.